Of relevance in the preparation of this outlook is the ENSO condition. The equatorial Pacific has exhibited clear El Niño conditions since June 2009. El Niño conditions continue, but are weakening toward neutral conditions in the subsequent 1-2 months. Out of a large set of dynamical and statistical forecast models, most are trending towards neutral conditions in summer 2010, while some others are turning into <?xml:namespace prefix = st1 ns = "urn:schemas-microsoft-com:office:smarttags" />La Niña conditions in summer 2010. Based on common scientific understanding on the mechanism of Asia summer monsoon, including the India summer monsoon and East Asian summer monsoon, and interpretation of prognostic products of it, the Indian summer monsoon and East Asia summer monsoon were predicted to be weak than normal during the coming summer. The predictions on precipitations obviously contained much inconsistence, although consensus on possible influence of ENSO and summer monsoon circulation was reached. 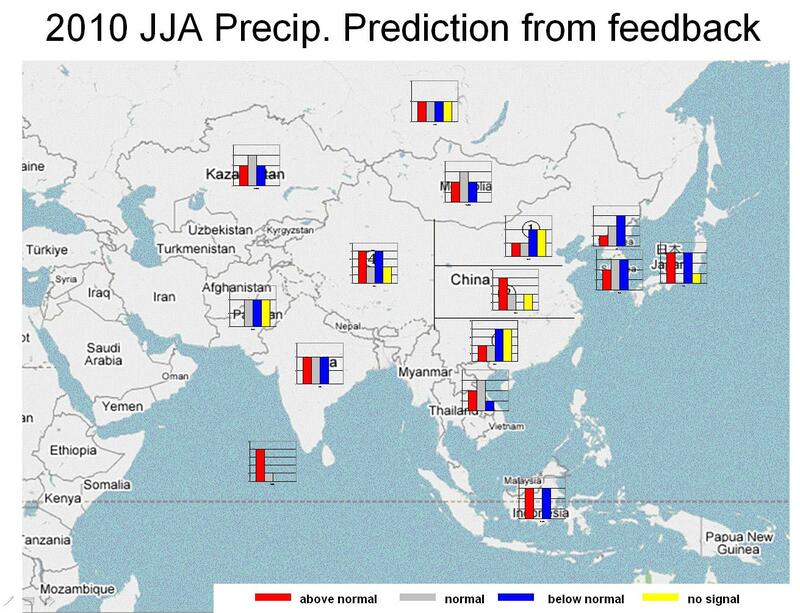 The relative consensus prediction of precipitation mainly focused in the central part of East Asia, part of southeast Asia, southern part of South Asia, with positive precipitation anomalies located in these regions during the coming summer. While, the inconsistencies mainly located in West China, south part of Southeast Asia part of West Asia region. The consensuses were reached on temperature anomalies of Asian region during the coming summer that most of predictions indicated warmer than normal or near normal. The methods used in prediction were surveyed for all participants. The results showed that there were 10 predictions were made by dynamical method, 8 predictions by statistical method, and 4 predictions by both dynamical and statistical method. 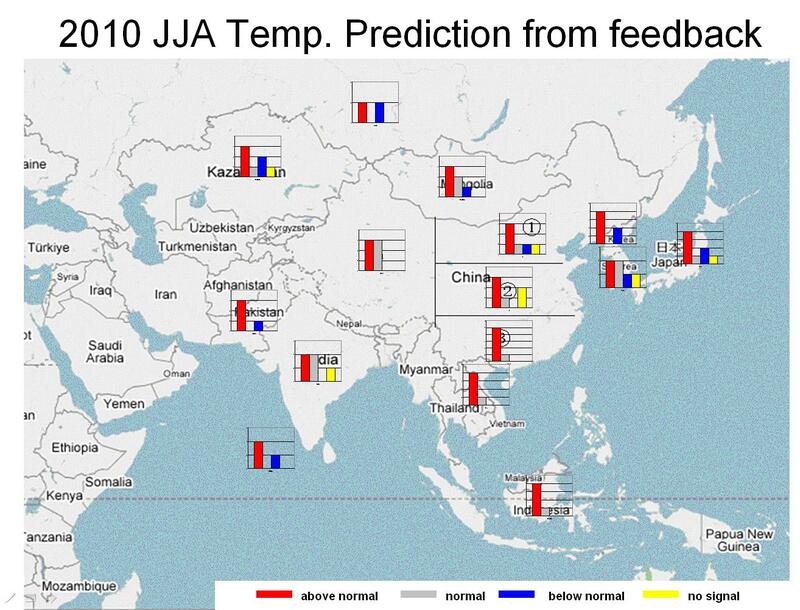 Based on these surveys, the details of temperature and precipitation prediction for JJA 2010 by different participants were also be synthesized and shown in Fig. A and Fig. B, respectively. From the figures, we could easily find that for some regions, the forecasts were too different to obtain a consensus of forecast even by using the state-of-the-art models. Thus, it should be kept in mind that the predictions in Fig A and B contained uncertainty in some particular areas, and accordingly, caution should be taken in using the information. In addition, it is stressed that these predictions were relevant only to seasonal time scales and relatively large areas.